from the blue chair: I am featured today on Gen X Quilters! 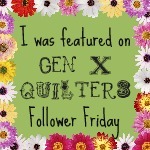 I am featured today on Gen X Quilters! Check out Gen X Quilters today. AnneMarie is featuring me and my blog for her Follower Friday! Congratulations! What a great profile! congrats!! thats a wonderful piece about you and your fabulous work!! What a fun feature! Congrats!! Yea! Glad to "get to know you"! I'm part of a boy girl twin too :-). So nice to meet you! I love your stuff! Good luck with your Bliss! It is a fun line to work with. I made a baby quilt with it using a pattern from Moose on the Porch Quilts. Super cute! I do not sew clothes. A nice surprise after a very long day.